LAST DAY TO ENTER TO WIN a twin size organic cotton mattress worth $494! Sleep. It’s no doubt one of the biggest topics on your radar as a parent. How much or how little sleep you and your kids are getting, co-sleeping, sleeping through the night, big kid beds… you get the idea. But a not so discussed topic is what kind of mattress are you sleeping on, and is it nontoxic? We spend 1/3 of our lifetime in bed, so slipping into slumber on a natural mattress will eliminate prolonged exposure to the dangerous cocktail of chemicals that are embedded in conventional mattresses. We know how important a safe sleep environment is, and one that’s free from off gassing materials, so we’re giving one lucky Inhabitots reader a twin-sized Pure Echo mattress valued at $494! The Pure Echo mattress is a medium-firm mattress comprised of GOTS certified organic cotton and Joma wool that serves as a fire barrier — so it meets all flame retardant standards without any of the toxic chemicals inherent in traditional beds. BONUS: Inhabitots readers can visit My Green Mattress today to take advantage of a special promotion: get $75 off any mattress when you use the code INHABITOTS$75. 2. LEAVE A COMMENT BELOW telling us what you like best about the Pure Echo Mattress and why you should be the lucky winner of an organic, green mattress. Due to popular demand, we are happy to announce that we are extending the deadline to 7/8/2015 11:59PM EST. We want to give our loyal readers, friends, and family the opportunity to win this organic cotton mattress and have a better night’s sleep! 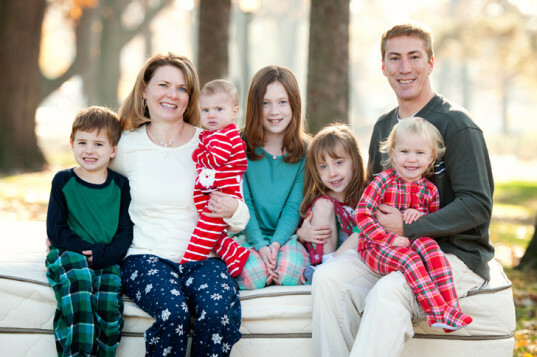 We love the story behind My Green Mattress because it boils down to a father of five children who wanted to improve his daughter’s health when she suffered from severe eczema. My Green Mattress founder Tim Masters and his wife Cindy took their second born daughter Emily to pediatric dermatologists for help, but they also proactively sought out ways to improve Emily’s symptoms via their own research. Thus, they discovered that all-natural products were a key component in alleviating symptoms of eczema — and one of Tim’s first moves was to put an all-natural mattress in his daughter’s crib, and then to offer all-natural mattresses to consumers through his company. Tim went on to develop the Organic Dream Mattress and Emily currently sleeps on this safe mattress that was handcrafted by her dad. Additionally, mattresses from My Green Mattress are handcrafted in the USA using USA sourced organic cotton. Now it’s time to enter to win your very own safe, nontoxic mattress to create a soothing sleep haven in your home! This is for information purposes only and is not intended to substitute medical care nor is it intended to diagnose or treat a medical condition. My favorite thing about the mattress is that it's filled with hypoallergenic natural materials. My daughter will be able to sleep soundly without feel stuffy. Love that they are USA made, how cool! I would love to win for my 3-year old who is outgrowing the toddler bed. Most parents always want and do the very best for their children from the very beginning. Having "sensitive" children can be very challenging, yet always worth it! Being able to provide our children with a healthy environment is critical to their well-being and development. Having a healthy place (their bed) where they spend 1/3 of their life is critical. Having an organic cotton mattress (and other non off-gassing materials) is crucial to a sensitive child waking up refreshed, free of a foggy brain or lethargic body. How do we expect them to function at full capacity in school when their bodies are trying to detox their unhealthy environments? Our children truly are the future, and we need them to be healthy to take on and reverse the horribly toxic world we are handing over to them. I have wanted a new, and safe, mattress for a long time. Thanks for this opportunity! We are a MyGreenMattress family but with three little boys, the youngest being 2, we could certainly use the help of a gifted new mattress! The best thing about this mattress is that it's SAFE and that we can dream the night away rather than worrying about all of the toxic stuff in traditional mattresses. It's also quite fabulous that they are local (near our home in Chicago) and family owned/operated. Kudos to Inhabitots for promoting. We are giving my daughter's room a makeover. A green mattress would be perfect! The fact that they're USA-made is a major plus, and providing an allergen-free sleeping environment is a boon to my granddaughter's ongoing health. I'm in the process of organizing a major girly-geek room makeover for my g-kid, who's starting her first year at a tech magnet elementary school this fall. My husband's building the loft bed, and we've found wonderful girly-geek accessories. A first-class mattress for the bed would really help out so much, and the timing would be perfect. I have been an avid eco-maniac since I was pregnant with my son who is now 6. I was always a supporter of environmental issues, an animal advocate, and all things "green", but when I was pregnant I began to do extensive research on all aspects of organics- food, clothing, sustainable living, etc. I recently obtained my Master's degree in Ecopsychology and am searching for work. My son and I have been financially struggling for years and now that I have my completed my advanced degree I'm hoping to get us out of this financial hole so we can not only help ourselves, but help countless others as well. My son was born with a neuromuscular condition called Arthrogryposis Multiplex Congenita. I won't go into details but he was in a crib until after 2 years of age and is still in a toddler bed at age 6. He has outgrown his bed and is ready to be in a twin!!! I'm so proud of his independence (as parents are) and am so excited for him to move to a regular size bed. I would love, love, love to get a organic mattress for him but financially am unable to right now. To win this bed would be an amazing gift for anyone and my hope is that our society, and world, will continue to awaken to the realities of chemical/toxic exposure so that we may continue to move toward a sustainable and healthier life for all. Let's all support businesses that live by the triple bottom line- People, Planet, Profit! I love that it is organic and free of harmful chemicals! We spend so many hours of our life in bed and we need people to wake up and realize that a quality mattress is essential to healthy lifestyle! I love that I can trust there will be no issues with off-gassing because it is a quality product made with hypoallergenic materials. I am currently saving up for new beds and mattresses for my 6 yr old and 5 year old. Their beds are several months old and I feel like I can still smell the nasty chemicals in them, and their mattresses are from the thrift store and were "new" but I feel like they are not great either. The kids would greatly appreciate this new mattress! I would love a really good mattress. I currently have a foam twin mattress that I've had for over 7 years. I like the idea of a green mattress, the fact it's made with organic cotton and especially that it is made here in the USA. I look forward to the emails and weekly newsletter so I can learn more about this product. I'm so ready for a new mattress! Sensitive children grow into sensitive adults. As one of these sensitive adults living in a small space on a fixed income, I need a twin sized hypoallergenic mattress to improve my rest and reduce sleep problems. Well-loved and taken care of, this might be the last bed I'll ever need. ps We will also share the love by passing our organic cotton/wool crib mattress on to someone who would not otherwise be able to afford a new one. :-) We are a family with multiple food and environmental allergies, so we are conscious of how seemingly innocuous choices (like a mattress) can make a big difference. In order to invest in a safe and healthy organic cotton/wool crib mattress for our little one, we said �no� to a lot of other things. It was worth it since babies spend so much time sleeping. The little one is now outgrowing the toddler bed and crib mattress and we would love to be able to say �yes� to a new mattress without saying, �no� other good things like nature and music enrichment activities. Thanks for considering us! ps We will also share the love by passing our organic cotton/wool crib mattress on to someone who would not otherwise be able to afford a new one. :-) We are a family with multiple food and environmental allergies, so we are conscious of how seemingly innocuous choices (like a mattress) can make a big difference. We co=sleep, but as our son turns 6 he is starting to sleep on his own. How awesome would it be for him to start out on a truly organic mattress! I wonder how much better the population would be if we all had the chance to start off with organic mattresses? I hope we/ he wins this!! We co-sleep, but as our son turns 6 he is starting to sleep on his own. How awesome would it be for him to start out on a truly organic mattress! I wonder how much better the population would be if we all had the chance to start off with organic mattresses? I hope we/ he wins this!! I would love to have a Pure Echo Mattress for my 5 year old son. This mattress is just what he needs with his allergies - he wakes up coughing every morning! I love the materials used like wool which is naturally flame-retardant and organic cotton which keeps the body temperature regulated. The price is reasonable considering the thoughtful design and materials. Plus, you can't beat the 10-year warranty! Thank you for making such an eco friendly product that has the health of the consumer in mind! I love it filled with hypoallergenic natural materials. At age 72, my old bones and I would love to have a comfortable mattress with no pits and hollows, and that will not contaminate the world in its construction. I love that they are all natural and non-toxic! Dd needs a better mattress and this one would be perfect for her! I love that is is made in the US from US grown organic cotton. And of course, that it is free of flame retardants and nasty chemicals. My son has just outgrown his mattress so this would be perfect! Thanks for the chance! I love that it is hypoallergenic and that there would be no off gassing! My three year old is ready for his own bed and the twin would be perfect. I would love to have a safe bed for my daughter, and to that end these look great! We care a lot about creating a natural, healthy home for our family. We got rid of as much plastic as we could all over the house, we use simple and natural cleaning products, we buy organic clothing and bedsheets as much as we can, etc. A few years ago, we bought a wool mattress for our oldest daughter. It is not perfect - it gets slightly thinner at both ends, so we have to prop it up a bit so our daughter's head isn't lower than her body - but it's still better than a regular mattress. However we have not been able to buy one for our 4 yo daughter yet, because we were searching for a better quality one, at a reasonable price that we could afford. This Pure Echo Mattress would be perfect: I love that it seems really well built, durable, with organic and natural materials, including wool. It's all I've been looking for! I'm looking for healthful mattresses. I wear exclusively cotton clothes and would like to try a cotton-made mattress. If I win this twin mattress, I will probably end up buying your queen mattress. I also like that your mattresses are USA-made! Thank you! we need to go green all the way around. i suffer from severe allergies and need a mattress that is non-allergenic. I like that Tim, the founder, started the business to help his kid who suffered from eczema. My own child has had problems with eczema and I think it would be the perfect fit for him when he outgrows his current naturepedic mattress! Help! My mattress is giving me sinus problems. I like that it's free from dangerous off gassing materials and that it's made with high quality chemical-free, durable, long lasting materials (hypoallergenic natural materials and certified-organic cotton). As a family, we've decided to go organic with our food, clothing and cleaning products. This bedding option would definitely take us a step further in the right direction. We have a 10 month old who suffers from eczema and no matter what we use, it never seems to fully go away for any period of time. I had no idea that this mattress even existed. We would love the opportunity to win it. I also love the fact that its hypoallergenic and free of chemicals. Thanks for the opportunity! Considering we spend so much time face down on a mattress, shouldn't it have the eco-friendly qualities of "My Green Mattress"? Love it. Just in time as we are about to have our first baby and are looking for alternatives. Definitely will consider buying one of these if they also have one for cribs. Wouldn't mind having a twin mattress as a second bed though as it might come handy too; either for me, husband or a guest. Thanks. Have extreme allergies, this would help. I love that this mattress is all-natural. With something like a mattress, it's hard to find space for a conventional one to off-gas for weeks before use! Just tweeted and posted to my Facebook account this great promotion! My son has extremely sensitive skin, we were just researching how all natural or organic mattresses could possibly help. Money is tight and if we actually won this mattress for my son, we would be beyond grateful. I really love that these don't use any chemicals, and that they are made in the US! My 3 year old son is ready for a "big boy bed" and he has multiple allergies and eczema. This would be so great for him! What I like best about the Pure Echo Mattress is definitely the price! Why buy any other brand? I should be the lucky winner of an organic, green mattress because I have lived on a used mattress for over 15 years now. Thank you. I signed up for the Green Mattress newsletter & have been a subscriber of your Inhabitat newsletter. What I like most about the Pure Echo mattress, besides the affordable price, is the attention to detail in all the elements from the 768 individually wrapped coil spring system to the use of Joma Wool as a natural fire barrier. I should be the lucky winner of an organic, green mattress because my mattress is a hand-me-down that I've been using for 15 years so who really knows how old it is & like the Masters family, I believe it is doing me more harm than good. A new, organic mattress would be wonderful! Thank you for the opportunity & introduction. I have trouble sleeping and would love an organic, well-constructed mattress. There are so many things to love about the Pure Echo mattress, but my favorite is that it allows for a natural night�s sleep, free from dangerous off gassing materials. This would be great for my little girl's bed. No off gassing an lots of comfort! I love that it's made in the US and could really use this to replace one. 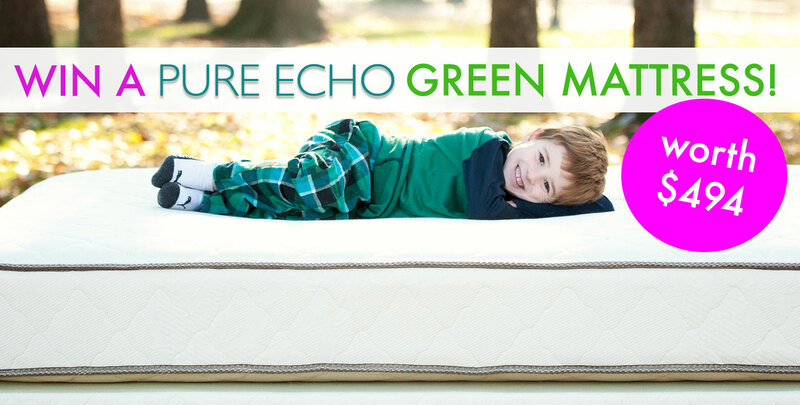 Both our children have allergies, asthma, and eczema, so I was excited to read about Green Mattresses, and the Pure Echo organic mattress in particular. You ask what I liked best about the Pure Echo, and it's difficult to say only one. Nonetheless, just one of the impressive things, to me, is the use of Joma Wool, which acts like a natural fire-retardant without all the detrimental chemicals that are used in traditional mattresses. It would be great to be chosen for the Pure Echo giveaway among all the worthy people who clearly would benefit from this kind of product. My 3-year-old currently sleeps with me, having never used a crib. My whole family has a long history of autoimmune diseases, allergies and eczema and his eczema is the worst that I have seen and keeps him awake itching many nights. When he chooses to move into his own bed, I would love for him to have a safe landing and this mattress would provide that! I would love to win this for my 7 yo. He has asthma, and the mattress he has is less than 2" thick so it is uncomfortable as well. And honestly, we could never afford over $500 for a mattress. Which is why we haven't replaced our 3 year old's or our own. We are about to transition our toddler from a toddler bed/crib mattress to a twin bed and are looking for a new, non-toxic mattress for her. Love that these are made of GOTS-certified organic cotton and wool for flame retardancy, right here in the USA! This is a wonderful mattress! My son also suffers from eczema and has a thin memory foam mattress. His is going to be six this year and needs a better mattress. Being a single mom makes getting a good mattress hard so winning this would be amazing! I would love to have this. I suffer from eczema and allergies. Sleep can be very uncomfortable sometimes. I think something like this would help me sleep in comfort. What's not to love? The materials are top-notch, and as someone who tends to have highly allergic skin reactions I'd love to win your Twin Green Mattress ... Besides, it's my birthday! Thanks and congrats for creating a quality product for people who value good sleep. i would love to have an organic mattress for my son! he will be getting a new bed for christmas and instead of a brand new mattress filled with toxins it would be so wonderful for him to get to lie down on a natural, organic mattress!! thanks so much for the giveaway! My daughter is just about to outgrow her crib and we'll be transitioning her to a twin bed. She has always slept on an organic crib mattress. She is a healthy kid, and I feel like that is in part due to being able to ensure that she has slept without toxins. As a no longer "Spring Chicken", my arthritic joints would welcome this fabulously made mattress. As a sufferer of multiple allergies, my respiratory system would say THANK YOU!!! I am sleeping on the floor, with a cushion. It may not be comfortable but I am used to it. A green mattress, however, would be a greatly comfortable asset to detoxifying my abode. I believe people can sleep more comfortably without breathing toxic chemicals used in making mattresses. Thank you for informing conscious consumers, like myself, about this company's organic and toxin-free furniture. I love this. My son is almost due for a big boy bed, and I would love for him to have a natural, non-toxic mattress. He has always been a sensitive sleeper, so I'm hoping that a green mattress will give him (and his parents! ), sweeter dreams. I love that your mattress is free of chemicals and toxic fire retardants! With a small child with a chronic health condition, I've wanted to get one of these mattresses for ages. I'm sure it would help enormously! I love everything about this type of mattress. My kids are about to need a new one and this fits the bill perfectly! Fantastic use of natural Eco-Safe materials. There is nothing better than a good nights sleep on a comfortable new mattress. My almost 10 year old daughter has been suffering from Eczema ever since she was a baby. We have tried everything including an organic crib mattress. That made a huge difference. Unfortunately she outgrew it and we could not afford a twin organic mattress as we decided to invest in an organic mattress for her younger sister. Her eczema is now back: she gets patches on her arms and legs that make her very self-conscious as she is a competitive figure skater and loves sports. She has also suffered from repeated pneumonias in the past couple of years. We want to go back to an organic mattress for her and hope we can soon afford one as our youngest daughter will need one too. Our family would really appreciate having this opportunity to help our daughter and support her and make more self-assured and a better sleeper! The Pure Echo exemplifies how ALL products ought to be made, yet almost none are. Not only is it healthy for humans and healthy for the planet, it is a wonderful example of Cradle to Cradle design thinking, where nontoxic materials become part of a biological nutrient metabolism at the end of the product's life cycle. Bravo! enfin un produit �colo, fini les allergies, toxines et bien �tre pour mon dos handicap� ! This would be a great mattress to replace my daughter's Ikea mattress with. Looks absolutely wonderful! My 4 year old grandson, who has eczema, just had a birthday. I asked his mommy for gift ideas for him and she said, "a big boy bed." They will be moving soon and I will make the 5 hour drive to see the new house and deliver a big boy bed. From everything I've read, your mattress could be the relief my grandson needs. I am on a low fixed budget and for me to purchase your mattress for him is not in that budget. Hopefully, I can win it for him. Thank you. Many family will celebrate the 4th of July moving Grace into her first adult apartment. She turned 21 on Cinqo De Mayo. She is all about freedom these days. I would love to honor her emergence into this new beginning with your healthy mattress. She was born into a family that practiced attachment parenting and slept in a family bed for many years. I think this gave her a firm foundation to push off of. I hope you will agree with me that your lovely mattress would be a perfect place to land. My youngest would benefit immensely from an organic mattress. Restless nights are common and hinder the rest her body needs for optimal health. What I like about the mattress is that it's chemical free. My daughter is vaccine injured and has a host of health and learning challenges. Keeping her toxin free is a top priority for us. We cannot at the time afford to get organic beds for our family as we are currently funneling most of our funds to wholesome, food, alternative health care and a holistic lifestyle in general. We would love to win this mattress for our daughter so we can help take some more of the toxin load off of her. Thank you! Would love to win an all natural, organic, made in the USA mattress for one of my twin grandsons! I love the idea of a toxin free mattress. This sounds perfect for my daughter who suffers from asthma. We have to relax to sleep well. How can we relax when we know we are breathing toxins? The healthy mattress you are giving away would help anyone who sleeps on that bed to rest well and safely. And it would provide me with peace of mind knowing i'm not poisoning someone! I would love to replace the mattress my newly 13yo daughter uses; a new, organic, wool protected and natural mattress would make her want to get in it. Thanks! That would be very trendy and more scientific . Give the children that quantum of Green Sleep. My daughter is 3, very tall for her age, and we would love to get her a big girl bed that is all natural and won't make her stuffy or congested. I love that this mattress came about because of a genuine concern a father had for his family's health rather than as a money making exercise; necessity is the mother of invention & mother nature can always help us out with that! I would love it even more if I was the lucky winner, because I'm getting married one month from today and my future husband and I are yet to get ourselves a bed! We're not living together yet, and we each have the same single bed we've had since we were kid. We've been looking for an eco-friendly mattress but haven't been sure we could afford it. He has chronic fatigue & I suffer from hay fever allergies & hypopnea, so it's important to us for our health that we get a good bed for a good night's sleep, but we're also both very concerned about sourcing responsibly sourced products that aren't harmful to the planet. It would be the most wonderful wedding gift to win this mattress and kick off our new life together greenly! What's not to like about this beautiful and safe mattress?! My son coughed uncontrollably until we switched out his mattress with his sister (luckily she has not shown any signs of distress). I've felt horribly guilty ever since. This would be a terrific opportunity to replace the "bad" mattress. Thanks so much! I love that wool is used in the Pure Echo Mattress since it is a natural flame retardant and therefore no toxic chemicals are added. I would be thrilled to win this twin mattress for my daughter so she could have a healthier environment at night as she currently sleeps on my old, overly-firm mattress from when I was a child. Thanks for the chance to win! I try to live the Eco lifestyle by growing my own veggies, belonging to several co ops and sleeping on an organic pillow with organic sheets. Now to complete my sleep comfort I would love to sleep on the organic mattress! I have allergies so anything that I can do to help myself without oct's or worse yet, pharmaceuticals would be wonderful! No Chemicals! No allergies! Eco Friendly! We've got kids with severe eczema (dyshidrotic), allergies, and chemical sensitivities. It would be WONDERFUL to have a clean, green mattress to help support their systems and eliminate environmental toxins. I love how I don't have to worry about sleeping on a toxin filled piece of fabric. The cotton mattress is my all time favorite! Hands down! I love the use of organic materials. Having my son sleep on one of these mattresses would relieve a lot of stress in our lives. Our family supports companies that promote healthy living, manufacture with organic materials, lower their carbon footprint by producing and employing within the USA. We are small farmers who works hard to provide organic nutritious food for our community and would love to give our toddler a chemical-free mattress to sleep on. Thank you! I love that it's made mindfully and in the usa. I would love this for my family and to help us sleep. The Pure Echo Mattress embodies sustainable living - literally and figuratively. Why I should be lucky enough to win this green, organic mattress is that it will put me one step closer to living in a sustainable manner in this world in the most comfortable way possible! I love that is is organic and would provide a peaceful and calming place for our baby to rest. Wow a mattress that can support my battle against my daughter's eczema is amazing! I love that it was born or America ingenuity. Wow, what an amazing story! Way to go Dad, its so awesome that you took it into your own hands to solve your daughters eczema and that you have helped so many others as a result! My husband and I have three children (the fourth is on his/her way), and all three have had eczema along with other health issues, currently my toddler has the worst eczema while my four year old has been constantly ill for about a year, I am just now suspecting the cause to be the used mattress we purchased around the time she started getting sick. Recently, my husband switched jobs which forced us to live with family for two months and her health issues are infinitely better! Although we are a low income family, cutting toxins out in our home has been a top priority for us, we have sacrificed much and we have been successful in most areas however we cannot afford toxin free furniture! I love that these mattresses are toxin free and we would be so ecstatic to win one, I think I would have my toddler and four year old share it :). I would love the Echo Green Mattress! I am a single mother of three, and keeping "green" can be very expensive at times, yet I care about my children living in a healthy environment. Organic Cotton is not only non-toxic but also hypoallergenic and breathable...thus making a perfect mattress! I am coming at this from the complete opposite side. I am the child trying to find a mattress that my mom can sleep on without waking stuffy, coughing or itchy. Winning her a new mattress would be a financial burden lifted from her shoulders. This would be so great for my son who has autism and scoliosis... he has never slept more than 5-6 hours in a stretch. We've tried several options and nothing ha helped much. Thanks. Wish us luck! I can see that many persons desire and deserve such a fine and clean mattress. I am 60 years old but very active and young. However, I am recently having trouble breathing at night time if there are any irritants close to my face. What is closer than your mattress? My husband and I are building a tiny home and this mattress could be proudly displayed in our tiny home design. What could be more lovely to go in our first, tiny home than this mattress. I love cotton. As a designer I find it to be versatile and desirable. I'm starting to look at mattresses for my 4 year-old's transition to a big kid bed. She has allergies and eczema, and her dad and I are hoping an organic mattress/chemical free mattress will help. It's definitely not easy to keep up with an organic/green lifestyle, it's not cheap. Especially when it comes to mattresses. Winning this would be a big help to us, as it would be to most families out there trying to rid their lives of too many harmful chemicals. Thanks for doing this! I love that it is hypo allergenic, made of certified organic cotton, and made in USA!! I forgot to say the reason I would be indebted to win this incredible mattress, is that my guest room has no bed and I have had to turn down family, grandchildren and friends, repeatedly this past year who wanted to visit. It would make such a healthy start in making my guest room an inviting, healthy environment that says welcome and I care! This mattress sounds amazing!!! The Pure Echo Organic Natural mattress is made of organic, natural materials like Joma Wool and certified GOTS organic cotton. Joma wool is a natural fire barrier and commonly used in traditional mattresses. I like that it is not full of synthetic materials causing my child to breath in chemicals while he sleeps. The Pure Echo now has 768 individually wrapped coils which is an upgrade from the previous model which had just 460. This reduces sleep interruption by motion transfer My son moves and wiggles ALL night long! Even though he is 5 years old he still often wakes up in the night at least once. All the extra coils individually wrapped also helps contour to any body shape or sleep position which would also make sleeping more restful for him. The company stands by their product with free shipping, a 90 day return policy, and a 10 year full warranty. Currently my son is sleeping on a thin foam mattress. If we could win this mattress it would be a game changer for us. Better sleep and more of it means happier, fun filled days!! Thanks Inhabititots and My Green Mattress for this giveaway!! I love that the PURE ECHO Green Mattress is made with certified organic and cotton materials, which is so important to me as a mother of two young children! Also, since my children have sensitive skin, I love that the mattress is hypoallergenic. As a mom, I can rest assured that with this mattress my children are not sleeping with hazardous chemicals! It is so important to me that my children have a safe and comfortable sleep! I would love to be the lucky winner of the Pure Echo Mattress as my 1 1/2 year old son transitions from co-sleeping with me to his own comfy and safe �big boy" bed!! Oops...I left my comment at 9:30 Western time!! WIN a twin size organic cotton mattress worth $494! Sleep. It's no doubt one of the biggest topics on your radar as a parent. How much or how little sleep you and your kids are getting, co-sleeping, sleeping through the night, big kid beds... you get the idea. But a not so discussed topic is what kind of mattress are you sleeping on, and is it nontoxic? We spend 1/3 of our lifetime in bed, so slipping into slumber on a natural mattress will eliminate prolonged exposure to the dangerous cocktail of chemicals that are embedded in conventional mattresses. We know how important a safe sleep environment is, and one that's free from off gassing materials, so we're giving one lucky Inhabitots reader a twin-sized Pure Echo mattress valued at $494! The Pure Echo mattress is a medium-firm mattress comprised of GOTS certified organic cotton and Joma wool that serves as a fire barrier -- so it meets all flame retardant standards without any of the toxic chemicals inherent in traditional beds. Bonus: Inhabitots readers can visit My Green Mattress today to take advantage of a special promotion: get $75 off any mattress when you use the code INHABITOTS$75. We love the story behind My Green Mattress because it boils down to a father of five children who wanted to improve his daughter's health when she suffered from severe eczema. My Green Mattress founder Tim Masters and his wife Cindy took their second born daughter Emily to pediatric dermatologists for help, but they also proactively sought out ways to improve Emily's symptoms via their own research. Thus, they discovered that all-natural products were a key component in alleviating symptoms of eczema -- and one of Tim's first moves was to put an all-natural mattress in his daughter's crib, and then to offer all-natural mattresses to consumers through his company. Tim went on to develop the Organic Dream Mattress and Emily currently sleeps on this safe mattress that was handcrafted by her dad. Additionally, mattresses from My Green Mattress are handcrafted in the USA using USA sourced organic cotton. Now it's time to enter to win your very own safe, nontoxic mattress to create a soothing sleep haven in your home!